The Pictorialism Portal aims first and foremost to enable research into the history of the imagery, publications, and exhibitions associated with art photography from around 1900 in the German-speaking realm. The portal also makes available the results of current research on Pictorialism in the form of papers that were presented at the international symposium “Inspirations – Interactions: Pictorialism Reconsidered,” held on November 21–23, 2013 at the Museum für Fotografie (The Museum for Photography) in Berlin. 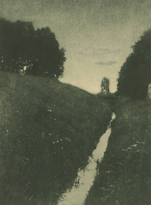 The Pictorialism Portal’s point of departure was a 16-month research project undertaken by the Kunstbibliothek – Staatliche Museen zu Berlin (the art library of the National Museums of Berlin) to examine its own holdings of art photography from around 1900. At the heart of the project was the collection of Ernst Juhl, one of Pictorialism’s most important champions in Germany. In addition to this, indexing work on the Pictorialism research archive compiled by the photo historian Enno Kaufhold made it possible to contextualize the Kunstbibliothek’s own holdings in terms of other published and exhibited art photographs from the turn of the last century. The research project was made possible by generous support from the German Federal Commissioner for Culture and Media. The project’s focus is on one of the most varied chapters in the history of photography. Aesthetically, the current of art photography around 1900 – also known as amateur photography (or, in German, “bildmässige Fotografie,” a direct translation “pictorial photography” and therefore also called Piktorialismus) – was above all characterized by the reciprocal inspiration between photography, painting, and the other graphic arts. From the 1880s on, extremely ambitious amateur photographers began to appear on the scene, organized into local associations. Their goal was to achieve recognition for photography as an art form. Their exchanges were based on regular exhibitions, publications, and association periodicals. Unlike the established professional studios of the day, these art photographers held aesthetic convictions, experimented with elaborate printing techniques, and tried out new compositional means. The painterly and graphic textures of the Pictorialist photographers make it possible to recognize the proximity to painting and the influence, in particular, of Impressionism, Jugendstil, and Symbolism. The primary motifs of art photography around 1900 were portraits, landscapes, and genre scenes. 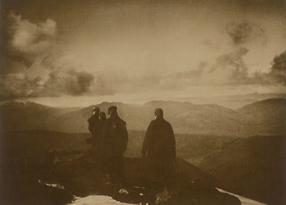 The research project’s point of departure was the collection of Ernst Juhl (1850–1915), one of the most significant supporters of the art photography movement in Europe. The independently wealthy Juhl came from a family of Hamburg businessmen and was active on behalf of photography’s “artistic emancipation” as a curator, exhibition organizer, editor of the Photographische Rundschau, writer, and jury member at international exhibitions, in addition to his significant activities as a collector. 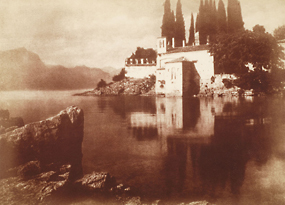 His collection, assembled between 1893 and 1911, encompasses some eight hundred works, making it one of the most comprehensive private collections of Pictorialism of its day. Portions of it were first shown in Berlin in 1910 in an exhibition at the Königliche Kunstgewerbemuseum (the Royal Museum for Decorative Arts). After Juhl’s death, two institutions purchased portions of the collection: the Museum für Kunst und Gewerbe (Museum of Arts and Crafts) in Hamburg and the Bibliothek des Berliner Kunstgewerbemuseum (the Library of the Berlin Museum of Decorative Arts) – the forerunner of today’s Kunstbibliothek. Other parts of the estate were destroyed during World War II. Together with the Matthies-Masuren Collection, the Juhl Collection, which has now been opened up to researchers and conservators, constitutes the core holdings of turn-of-the-century art photography at the Kunstbibliothek – Staatliche Museen zu Berlin. From the 1890s on, the painter and writer Fritz Matthies-Masuren (1873–1938) was as energetic as Ernst Juhl in addressing the art aspirations of amateur photography. His collection first arrived at the Kunstbibliothek as a loan and then, from 1924 on, as a permanent part of the library. It was presented and published by Christine Kühn in 2003. In addition to these two major estates, there are numerous additional individual prints, pieces of job printing, albums, and groups of works in the Kunstbibliothek’s holdings that can be categorized as Pictorialist. Altogether, some 680 Pictorialist works from the Kunstbibliothek are available for examination on the Pictorialism Portal, including 162 from the Juhl Collection and 141 from the Matthies-Masuren Collection.